Laid embroidery stitches are composite stitches – consisting or more than one stitch – common in wool embroidery, crewel, schwalm and other types of hand embroidery. These fillings can be heavy and dense, or light and airy depending on the spacing used when working them. These stitches are commonly worked using fine wool threads in a crewel piece. However, these stitches can be worked using almost any type of embroidery thread. Even novelty, ribbon or braid, wooly, fuzzy, or thick and bulky fibers can be used as the ground thread. These stitches are very versatile and have infinite design possibilities. 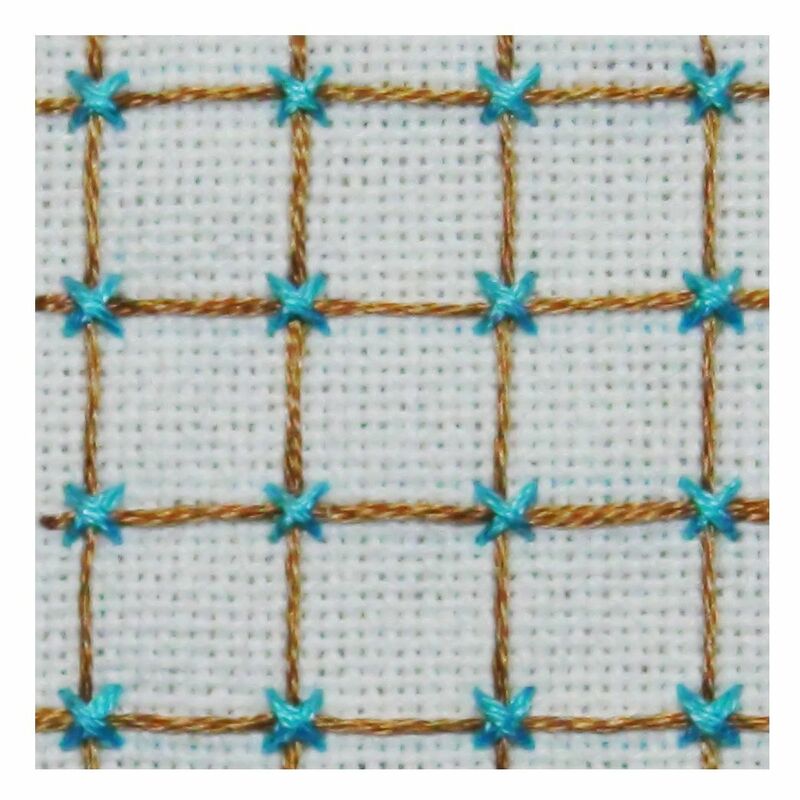 Work the laid fillings in a single color, or multiple colors, like the samples show below, or stitch a bead at the intersections to create a project with some glitz or bling. In spite of these stitches being composites, they're very easy to work. The square laid filling stitch is a composite stitch, used to fill areas in counted thread, crewel and other hand embroidery projects. To work the stitch, a ground of vertical and horiztonal intersecting threads is laid on the fabric. These threads are tacked in place by a half cross or full cross stitch intersections. This stitch can be a counted stitch to ensure even spacing, or pre-marked on the fabric and worked as a freestyle or surface embroidery stitch. The diagonal laid filling stitch is a composite stitch worked similarly to the square filling stitch, and is used to fill areas in counted thread, crewel and other hand embroidery projects. To work the stitch, a ground of diagonal, intersection threads is laid on the fabric. These threads are tacked in place by a small upright cross stitch at alternating (or at all) intersections. When the diagonal laid filling is worked as a counted stitch, the spacing is precise and even, but it can also be worked as a surface stitch by pre-marking the fabric, or freestyle, giving it an uneven, organic look.